Israeli warplanes launch dozens of airstrikes on the Gaza Strip for five hours. Two million Palestinians are victims of collective punishment policy amid a tide of incitement at political and military echelons in Israel. Four Palestinian civilians, including 2 women and a child, were wounded, in addition to damaging a wedding hall, an office belonging to the Ministry of Detainees and Ex-Detainees Affairs. Moreover, several houses sustained material damage. Three Palestinian civilians were killed and 12 others were wounded in different incidents in the West Bank. 16 civilians, including 4 children, a paramedic and a journalist, were wounded during the 25th boats rally for breaking the Siege along the Gaza Strip coastline. Israeli forces conducted 114 incursions into Palestinian communities in the West Bank and 5 other incursions into Jerusalem. 56 Palestinian civilians, including 3 children and 3 women, were arrested in the West Bank. Five of them, including a woman, were arrested in occupied Jerusalem. Israeli forces conducted one limited incursion in the central of Gaza Strip, where seven Palestinian were arrested while sneaking into Israel. Three civilians, including two children, were wounded in eastern Gaza City and al-Buriej refugee camp. An under-construction building belonging to al-Razi Private School were demolished in Sho’fat refugee camp. Four houses were demolished in Masafer Yatta, south of Hebron. A child was hit with a live bullet by an Israeli settler and seven others, including a child and a women, sustained fractures and bruises. Shooting incidents were reported against the fishing boats in the Gaza Strip Sea. Israeli forces established 92 permanent checkpoints and 149 temporary checkpoints in the West Bank. 11 Palestinian civilians, including 2 children and a woman, were arrested at military checkpoint in the West Bank. A Palestinian civilian was arrested in Beit Hanoun (Erez) Crossing. Israeli violations of international law and international humanitarian law in the oPt continued during the reporting period (14-20 March 2019). At approximately 01:00, Israeli forces moved into Dura City, southwest of Hebron and stationed in Singer neighbourhood. They raided and searched a house belonging to Amjad Sa’id ‘Amro (24) and then arrested him. The Israeli forces later withdrew taking him to an unknown destination. Around the same time, Israeli forces moved into the southern area of Hebron. They raided and searched a house belonging to Sa’id ‘Ali Abu Snaina (33) and then arrested him. The Israeli forces later withdrew taking him to an unknown destination. Mohammed Mahmoud Ahmed al-Qara (33) and he is married and father of three children. Mohammed Fadel ‘Assi al-Qahwaji (28) and he is married and father of three children. Ra’fat Rezeq Ra’fat Samour (27) and he is married and father of two children. Majed Majdi Rajab al-Qara (29) and he is married and father of three children. ‘Abd AL-Qader Sa’d ‘Abd al-Qader al-Qara (25) and he is single. It should be noted that the arrestees are from Bani Suhaila village, east of Khan Younis. At approximately 02:00, Israeli forces moved into Deir Abu Da’if, northeast of Jenin. They raided and searched a house belonging to Rami Jamal Yassin (26), and then arrested him, taking him to an unknown destination. At approximately 02:30, Israeli forces moved into Kafr Thalth village, east of Qalqilia. They raided and searched a house belonging to Hazim Shqiar Hussain Marab’a (46) and then arrested him along with his brother Nezam (39), taking them to an unknown destination. At approximately 03:00, Israeli forces moved into Jericho. They raided and searched a house belonging to Qaher Majed Farraj (27), and then arrested him, taking him to an unknown destination. It should be noted that the arrested civilians are students at Birzeit University. At approximately 08:00, Israeli forces moved into ‘Azzoun ‘Atma in Qalqilia. They raided and searched a house belonging to Anas Rateb ‘Abd al-‘Aziz Ahmed (31) and then arrested him, taking him to an unknown destination. Note: During the aforementioned day, Israeli forces conducted (7) incursions in the following areas and no arrests were reported: Yatta, Bani N’aim, al-Sara, and Beit al-Roush in Hebron; Tulkarm; Massha and Kaffl Haress villages in Salfit. For five hours, two million Palestinians in the Gaza Strip lived in a state terror and fear due to the continuous Israeli airstrikes that targeted various locations; some were in densely populated areas throughout the Gaza Strip. This happened amid a tide of incitement at political and military echelons in Israel. According to PCHR’s fieldworkers, Israeli warplanes launched 51 missiles at 19 targets throughout the Gaza Strip. Some of those targets were struck more than once. Targets varied between civilian facilities, including a wedding hall, an office for Former Prisoners, and agricultural land, in addition to sites belonging to the Palestinian armed groups. In one of the airstrikes, Mahmoud Hamdan Hammad Soe’ed (39) sustained moderate wounds and his pregnant wife Sabah ‘Omar Soe’ed (23) sustained serious wounds and her hand was amputated after shrapnel fell on their house in Rafah due to an airstrike targeting a site that is only hundreds of meters away from their house. Moreover, a woman and a gril were injured. During the Israeli airstrikes, Israeli warplanes fired four missiles at al-Mahroussa Wedding Hall in al-Shaikh ‘Ejlin neighborhood, south of the Gaza Strip. As a result, the wedding hall was totally destroyed. 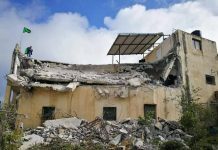 Moreover, the Israeli warplanes fired another three missiles at the Executive Office of the Ministry of Detainees and Ex-Detainees Affairs, which is a one-floor building and roofed of tin plates. As a result, it was totally destroyed and the adjacent buildings sustained damage as their windows were broken. The office is located east of the Ministry of Public Works and Housing in Tal al-Hawa neighborhood, which is densely-populated. At approximately 01:30, Israeli forces moved into Kaffr Thalth, east of Qalqilia. They raided and searched a house belonging to Hazim Shqair Hussain Marab’a (46) and then arrested Hazim’s mother, Rasmeya Marab’a (72), taking her to an unknown destination. At morning hours, Israeli forces stationed along the border fence with Israel, east of al-Amal neighborhood, northeast of Beit Hanoun, north of the Gaza Strip, arrested two civilians while attempting to sneak via the border fence. The arrested civilians were identified as Akram Mohammed ‘Eid Abu Qayda (20) and ‘Amer Farid Slaiman Abu Jarad (27), both from ‘Ezbet Beit Hanoun. It should be noted that in the afternoon, the Israeli forces declared that they arrested two civilians, who sneaked via the border fence and referred them to investigation. 1-The first wounded civilian (19) was hit with a rubber bullet to the foot. 2-The second (23) was hit with a live bullet to the right foot. 3- The third (27) was hit with a rubber bullet to the left thigh. 4-The forth (19) was hit with a rubber bullet to the foot. 5-The fifth (22) was hit with a rubber bullet to the foot. Moreover, Before the Israeli forces withdrew, they confiscated the DVR of the surveillance cameras in the camps’ shops. Note: During the aforementioned day, Israeli forces conducted (5) incursions in the following areas and no arrests were reported: Dura and Halhoul and Kharass village in Hebron; al-Laban al-Sharqeya village, south of Nablus; Flamia village, north of Qalqilia. At approximately 08:30, Israeli forces stationed along the border fence with Israel, east of Deir al-Balah, opened fire at farmers in the eastern areas. As a result, the farmers were forced to flee fearing for their lives, and no casualties were reported. Note: During the aforementioned day, Israeli forces conducted (14) incursions in the following areas and no arrests were reported: Balata Refugee Camp, east of Nablus; ‘Amouria and al-Laban al-Sharqeya villages, south of Nablus; Hebron and Dura; al-Assamou’ and Beit Marssam in Hebron; Salfit; Yassouf village, east of Salfit; Kubar, al-Nabi Saleh, Beit Rima, Qrawa Bani Zaid, and Deir Ghassana villages, northwest of Ramallah. At approximately 01:00, Israeli forces moved into al-Khader village, south of Bethlehem. They raided and searched a house belonging to Mohammed ‘Ali Ghnaim (17) and then arrested him, taking him to an unknown destination. Around the same time, Israeli forces moved into Bethlehem and stationed in Hendaza area. They raided and searched a house belonging to Waleed Nasser Mssalam (20) and then arrested him, taking him to an unknown destination. Around the same time, Israeli forces moved into al-Doha village, west of Bethlehem. They raided and searched two houses belonging to Moahmmed ‘Adnan Malsh (23) and Mos’ab Sobhi al-‘Azza (25) and then arrested them, taking them to an unknown destination. At approximately 03:00, for the second time, Israeli forces moved into al-Khader village, south of Bethlehem. They raided and searched a house belonging to Islam Ahmed Salah (30) and then arrested him, taking him to an unknown destination. At approximately 09:00, Israeli soldiers stationed along the border fence with Israel, east of al-Shoka village, east of Rafah, opened fire at agricultural lands and no casualties were reported. At approximately 09:30, following an attack against a site belonging to the Israeli forces at the intersection of “Ariel” settlement, north of Salfit, the Israeli forces declared the area as closed military zone. Large Israeli forces closed the Bypass Road (‘Aber al-Samera Street) adjacent to “Ariel” settlement, and the entrances to Bedia, Marda, Kafl Haress, Haress, Sarta, Broqin, Massha, al-Zawya, Deir Istaya, Kaffr al-Dik, Iskaka, Yassouf villages, and Salfit. They combed the area, especially Broqin village, where they found the vehicle which the attacker used in his withdrawal. At afternoon hours, Israeli forces backed by a large number of vehicles moved into Broqin village and closed all its entrances. They raided and searched houses and shops and investigated civilians asking them if they saw the attacker. Moreover, they arrested Zakaria Mahmoud Ibrahim ‘Abd al-Majid Samara (47) and ‘Abd al-Hafith Shafiq ‘Abd al-Hafith ‘Abdullah (39). Meanwhile, dozens of civilians gathered and threw stones Israeli soldiers, who immediately fired rubber bullets at the stone-throwers, causing the injury of two civilians; a 19-year-old civilian who was hit with a rubber bullet to the leg and a 24-year-old who was hit with a rubber bullet to the right hand. After the Israeli forces claimed that their intelligence services have suspects that Omar Ameen Youssof Abu Laila (19), from al-Zawya village, west of Salfit, was the attacker, they raided and searched his house. Before their withdrawal, they arrested Omar’s parents; Amin Youssof Mahmoud Abu Laila (46) and Ghadeer ‘Abd al-Jaber Messleh Abu Laila (38), and Omar’s brother, Nour al-Din (17). Moreover, they took the house measurements preluding to demolish it. Around the same time, Israeli forces moved into Bedia village. They raided Abu Laila Shop for clothes belonging to Omar’s family. They blew up the shop’s doors and damaged its contents. Israeli forces moved into Kaffr al-Dik village and combed it. They raided the Municipality building and confiscated the DVR of the surveillance cameras there. Note: During the aforementioned day, Israeli forces conducted (15) incursions in the following areas and no arrests were reported: al-Massaken al-Sha’beya neighborhood, northeast of Nablus; Ertah suburb, west of Tulkarm; Tarqoumia, al-Shaoukh, and Beit ‘Omra villages and al-‘Aroub Refugee Camp in Hebron; Marda, Kaffl Haress, Haress, Sarta, Massha, Deit Istaya, Kaffr al-Dik, Iskaka, and Yassouf villages in Salfit. At approximately 01:30, Israeli forces moved into Hebron. They raided and searched two houses belonging to Bassam Moahmmed Doffash (38), in Abu Ktaila neighborhood, and ‘Amar ‘Ali al-Rejbi (39), in Nemra neighborhood, and then withdrew. However, no arrests were reported. At approximately 02:00, Israeli forces moved into Beit Ummar village, north of Hebron, and stationed in al-‘Ain area. They raided and searched a house belonging to Sa’id Mohammed al-‘Alama (22) and then arrested him, taking him to an unknown destination. Around the same time, Israeli forces moved into al-‘Azza Refugee Camp, north of Bethlehem. They raided and searched a house belonging to Mo’ath ‘Abd al-Jabar ‘Abd al-Latif Abu Tarboush (33) and then arrested him, taking him to an unknown destination. At approximately 02:30, Israeli forces moved into Kharouba neighborhood, north of Jenin. They raided and searched two houses belonging to Ahmed Moussa al-Mogheer (18) and Omar ‘Aqel Omar (18) and then arrested them, taking them to an unknown destination. Around the same time, Israeli forces moved into Jenin. They raided and searched a house belonging to Mohammed Ahmed ‘Abd al-Halim Sabarna (18) and then arrested him, taking him to an unknown destination. At approximately 04:00, Israeli forces moved into al-Khader village, south of Bethlehem. They raided and searched a house belonging to Bahaa’ Mohammed ‘Issa (24) and then arrested him, taking him to an unknown destination. At morning hours, Israeli forces stationed along the border fence with Israel opened fire at Khaled ‘Abd al-Ra’ouf Abu Ghanima (21), from al-Sheja’ia neighborhood, east of Gaza City. As a result, Khaled was hit with a live bullet to the chest. According to PCHR’s investigations, Khaled was near the industrial zone (Karni) collecting gravel and stones using his cart to sell them. At approximately 08:30, he arrived at al-Shifa Hospital in Gaza City, where his injury was classified as serious. At approximately 13:30, Israeli forces stationed along the border fence with Israel, east of Deir al-Balah, opened fire at shepherds in the eastern areas. As a result, the shepherds were forced to flee fearing for their lives, and no casualties were reported. Note: During the aforementioned day, Israeli forces conducted (14) incursions in the following areas and no arrests were reported: Salem village, northeast of Nablus; Qabatia village, southeast of Jenin; Bedia, Marda, Kaffl Haress, Haress, Massha, Broqine, al-Zawya, Deir Istaya, Kaffr al-Dik, Iskaka, and Yassouf villages in Salfit. At approximately 01:00, Israeli forces moved into Taqou’a village, southeast of Bethlehem, and stationed in Khalil al-Wazir Square neighborhood. They raided and searched two houses belonging to ‘Abullah Yusuf Abu Mefreh (20) and Mohammad Najy Hmeid (19) and then arrested him, taking them to an unknown destination. Around the same time, Israeli forces moved into the southern area of Hebron. They raided and searched a house belonging to ‘Ali Mahmoud al-Rajaby (39) and then arrested him, taking him to an unknown destination. At approximately 02:00, Israeli forces moved into Nablus. They raided and searched a house belonging to ‘Omar ‘Abdul Raheem Abu Shosha (30) and then arrested him, taking him to an unknown destination. Around the same time, Israeli forces moved into Qaryout village, north of Nablus. They raided and searched a house belonging to Mo’tassem Rabah ‘Abbas Kassab (19) and then arrested him, taking him to an unknown destination. At approximately 03:00, Israeli forces moved into Bethlehem and stationed on al-Saf Street in central Bethlehem. They raided and searched a house belonging to Fares Ibrahim al-Yamany (33) and then arrested him, taking him to an unknown destination. At approximately 13:00, Israeli forces stationed at a checkpoint established on Wadi al-Nasara Road in the southern area of Hebron, pursued the school’s students while they were back from Zyad Jaber Primary School. They then arrested Zein al-Deen Ashraf ‘Abed Edrees (10) while he was at the headmaster’s office. Meanwhile, teachers at the school, who were assaulted by the Israeli soldiers, managed to prevent the soldiers from arresting Zein’s brother Nadeen (7). The arrested child was taken to a metal detector gate, which is 50 meters away from the school. The child was later released after interventions of the village’s residents and his mother. At approximately 16:20, Israeli soldiers stationed behind sand berms along the border fence with Israel, opened fire at Palestinian civilians, who were 70 meters away, west of the aforementioned border fence, east of al-Bureij refugee camp in the central Gaza Strip. As a result, two children were hit with live bullets to the lower limbs and their injuries were classified as moderate. At approximately 18:20, an Israeli drone fired a missile at a group of Palestinian civilians, east of al-Shwakah, east of Rafah, south of the Gaza Strip, and no injuries were reported. At approximately 19:00, an Israeli force from the Yamam Unit, which is part of the Israeli “Mista’arvim” units that are dressed like Palestinian civilians, infiltrated ‘Abwein village, north of Ramallah. The Israeli force used civilian cars, infiltrated the village through a dirt road, and then stationed in the Old City. The Israeli force surrounded houses amid heavy shooting. An Israeli officer shouted over loudspeakers, calling everyone inside to get out. They then blew up a house after an armed clash erupted between the Israeli force and unknown persons. Meanwhile, Israeli forces backed by around 20 military vehicles moved into the village from all its entrances. Following that, many Palestinian young men gathered and threw stones and empty bottles at the Israeli forces, who immediately fired live bullets, sound bombs and tear gas canisters at them. As a result, three civilians were wounded. The first civilian was hit with a live bullet to the foot, and the second one (20) was hit with shrapnel to the neck, while the third one (22) was hit with rubber bullet to the mouth. Moreover, the Israeli soldiers pursued and physically assaulted Ahmad Ja’far and then arrested him. Furthermore, they fired tear gas canisters at journalists, including Jehad al-Jayusi, a photojournalist at Palestinian Satellite Channel. 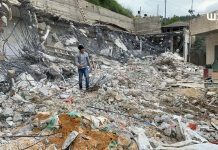 Eyewitnesses said to PCHR’s fieldworker that the village’s residents headed to the house, which was blown up, and saw clothes and brain parts. Meanwhile, the Israeli Shin Bet published on their website that Omar Abu Laila (19), from al al-Zawya village, west of Salfit, was killed. It should be noted that Omar was accused of carrying out a murder at “Ariel’s” settlement square. Before they withdrew, they arrested four civilians, including a father and his two sons. The arrestees were identified as Sultan Dabour (50), and his sons Ahmad (26) and Mohammad (23); ‘Odai ‘Azzam Hamad (18). At approximately 23:00, Israeli forces moved into Nablus to protect hundreds of settlers, who were going to perform their Talmudic prayers in “Joseph Tomb” in Balata al-Balad, east of Nablus. Fifteen minutes after the incursion, an Israeli infantry force covering behind buildings and stores at the entrance to the sub-road to ‘Amman Street opened fire at a Palestinian civilian car carrying two civilians identified as Raed Hashem Mohammad Hamdan (21) and Ziad ‘Emad Mohammad al-Noury (20), both from Nablus. Following that, an Israeli military bulldozer arrived and crushed the car, turning it over several times. They then confiscated the car, and the corpses were taken to Howrah refugee camp, south of the city. Meanwhile, a Palestinian ambulance tried to reach the causalities several times, but the Israeli soldiers prevented it and even opened fired at, directly hitting its front. At approximately 05:00 on Wednesday, 20 March 2019, after withdrawing from the city, the Israeli forces handed the 2 corpses to an ambulance belonging to the Palestinian Crescent Society at Howrah Checkpoint. They were both taken to Rafidia Hospital in Nablus, where it was found that Ra’ed was wounded with several bullets to the chest and shoulder and sustained laceration in his hand while Zaid was wounded with several bullets to the back and head and sustained laceration to the back of his head. Following that, the Israeli forces claimed that a speeding car opened fire at them on Amman Street, but no causalities were reported. However, the eyewitnesses’ accounts to PCHR’s fieldworker categorically denied that the Israeli forces were subject to fire. Moreover, in an attempt to hide their crime, the Israeli forces confiscated the DVRs of the surveillance cameras in the nearby shops in the area. Note: During the aforementioned day, Israeli forces conducted (19) incursions in the following areas and no arrests were reported: Deir Abu Mash’al and Qarawat Bani Zeid, northwest of Ramallah; ‘Arraba village, southwest of Hebron; Biddya, Marda, Kifl Haris, Haris, Sarta, Mas’ha, Bruqin, Kufor al-Deek, Iskaka, Yasuf villages in Salfit; Dura, Sa’ir, Beit ‘Ummar, and Haska villages in Hebron. At approximately 01:00, Israeli forces moved into al-Zawiya village, west of Salfit. They raided and searched two houses belonging to ‘Omar Ghassan Mustafa al-Mouqady (19) and Mou’aweeya Sufian Yusuf Abu Laila (22) and then arrested them, taking them to an unknown destination. At approximately 02:30, Israeli forces moved into Tamoun, southeast of Tubas. They raided and searched a house belonging to ‘Abdul Rahman Bani ‘Oda (24) and then arrested him, taking him to an unknown destination. At approximately 03:00, Israeli forces moved into Surif village, west of Hebron. They raided and searched two houses belonging to Eyad Mahmoud Ghneimat (33) and Khaled ‘Ali Ghneimat (36) and then arrested them, taking them to an unknown destination. At approximately 08:30, Israeli gunboats stationed off al-Waha shore, north of Beit Lahia, north of the Gaza Strip, heavily opened fire at Palestinian fishing boats sailing within one nautical mile and chased them. As a result, fishermen were force to flee for fear of their lives and no casualties or damage to their boats were reported. At approximately 10:30, Israeli forces backed by five military vehicles, moved around 100 meters into the west of the border fence with Israeli, east of Gaza Valley village (Johr al-Dik). The military vehicles leveled lands adjacent to the border fence. The incursion continued until 14:30 as the Israeli forces redeployed along the border fence. At approximately 21:30, Israeli forces stationed at al-Nashash military checkpoint, south of Bethlehem, opened fire at a vehicle belonging to ‘Alaa’ Moahmmed Ghyatha (38). As a result, ‘Alaa’ was hit with a live bullet to the abdomen and taken to al-Yamam Hospital and he is in critical condition. Moreover, while civilians were evacuating passengers from the vehicle to relive them, Ahmed Jamal Mahmoud Mahmoud Manassra (26), from Fokin Valley village, west of Bethlehem, was hit with live bullets to the chest, shoulder and hand, immediately causing his death. According to PCHR’s investigations into the second crime and eyewitnesses’ accounts, ‘Alaa’ Mohammed Ghayathah was driving his car with his wife and two daughters, returning from a visit to his in-laws in Artass village, south of Bethlehem, to Nhaleen village, west of the city, taking al-Nashash Station Road. When he stopped for the traffic light, a car scraped the back of his car, so he got off to check what happened. A female Israeli soldier in a watchtower near the checkpoint immediately opened fire at him, wounding him with several bullets to the abdomen. Ahmed Jamal Manassra, from Foqin Valley in western Behtlehem, whose car was behind ‘Alaa’’s car, saw the incident and immediately along with young men near the checkpoint took ‘Alaa’ to al-Yamama Hospital in al-Khader village near the place. A video captured by the surveillance cameras of al-Yamamah Hospital showed Ahmed taking ‘Alaa’ to the hospital and then cleaning the backseats of his car from ‘Alaa’’s blood to go back again to al-Nashnash checkpoint. When Ahmed reached ‘Alaa’’s car to check out Alaa’s family and evacuate them from the car, the Israeli soldiers opened fire at him. As a result, Ahmed was hit with eight live bullets; six of them hit his chest, shoulder and hand, causing his death before he was taken to Beit Jala Governmental Hospital. Eyewitnesses confirmed that Ahmed seemed worried after he arrived at al-Yamama Hospital and hospitalized ‘Alaa’ as he was making phone calls. Ahmed also asked a young man beside him about the time that an ambulance would take to arrive at the checkpoint. The young man answered that it would take ten minutes. Ahmed said, “I promised the wounded man that I will bring him his wife and daughters.” It should be noted that Ahmed was from Fokin Valley village, west of Bethlehem, and held a BA from the Palestine Ahliya University. At approximately 23:30, Israeli forces stationed along the border fence with Israel, east of Khan Younis, south of the Gaza Strip, opened fire at agricultural lands, east of ‘Abassan al-Jadida and al-Qarara villages, west of the border fence, in addition to firing flare bombs in the sky and no casualties or damage were reported. Note: During the aforementioned day, Israeli forces conducted (7) incursions in the following areas and no arrests were reported: Tulkarm; al-Shwaika suburb, Nour Shams and Tulkarm Refugee Camps in Tulkarm; Bani N’aim and Karma villages and al-Fawar Refugee Camp in Hebron. At approximately 22:30 on Tuesday, 19 March 2019, Israeli forces stationed in Beit Hanoun “Erez” Crossing, north of the Gaza Stripm arrested Anad Ayman Salem Dohal (22), from Gaza City. Dohal applied for permit via the Palestinian Liaison and the Israeli Intelligence Service summoned him for an interview. At approximately 11:00 on Tuesday, 19 March 2019, he headed to the crossing and in the evening his family was informed that he was arrested. Dohal holds Nablus ID card and as his parents are separated he wants to live with his mother in Nablus. At approximately 23:50 on Thursday, 14 March 2019, Israeli forces arrested Tareq Nazem al-Barghouthi (29), from Kafreen village, while he was passing through a checkpoint established at the entrance to al-Nabi Saleh village, northwest of Ramallah. At approximately 16:20 on Friday, 15 March 2019, Israeli forces arrested Shadi Ahmed Mohamed Karkar and Ahmed Ibrahim Ahmed ‘Atayiah, from Kafur Ni’mah village, west of Ramallah, while they were passing through a checkpoint established at the entrance to the village. At approximately 18:00, on Friday, 15 March 2019, Israeli forces stationed at Za’tara checkpoint, south of Nablus, arrested Samed ‘Abdul Jabbar Tameem (22), from Bizzariya village, northwest of Nablus. At approximately 01:00, on Saturday, 16 March 2019, Israeli forces stationed at checkpoint 160, established at the southern entrance to Hebron’s Old City, arrested Ajmad Bahjat al-Ja’bary (16) and released him three hours later. It should be mentioned that the Israeli soldiers stationed at the checkpoint search Palestinian civilians and fire sound bombs and tear gas canisters at students, who go to schools near the checkpoint. At approximately 10:00, on Sunday, 17 March 2019, Israeli soldiers deployed in the vicinity of al-Ibramimi Mosque, in Hebron’s Old City, arrested Walaa Akram Taleb Gaith (17) and then took her by a military police vehicle to a an investigation center in “Kiryat Arba” settlement, east of Hebron. The Israeli soldiers alleged that Walaa had a knife and was intending to carry out a stabbing attack. On Monday, 18 March 2019, Israel forces stationed at a military checkpoint established at the entrance to Kaful Hares villafe, north of Salfit, arrested the two siblings Ahmed (12) and Khadir Mahmoud Ahmed Shoqair (23), while getting out of the village via their car. At approximately 21:00, on Monday, 18 March 2019, Israeli forces stationed at al-Za’eem checkpoint, east of occupied east Jerusalem, arrested Thaer Anees Ghabesh (34), while passing through the checkpoint. On Tuesday, 19 March 2019, Israeli forces stationed at a military checkpoint established near the Arab American University, south of Nablus, arrested Mohamed ‘Adel Mostafa Mu’alla (19), from Qabatiyia village. On the same day, Israeli forces arrested Israa Hammad Abu Isninah (22), while attempting to pass through Abu al-Rish checkpoint in Hebron. At approximately 04:00, on Friday, 15 March 2019, Israeli forces moved into al-Isawiya village, northeast of occupied east Jerusalem. They raided and searched a house belonging to activist Mohammad ‘Abdullah Abu al-Humus (48) and then arrested him, taking him to an unknown destination. It is should be mentioned that Abu al-Humus called for participating in a marathon organized in central occupied East Jerusalem, against an Israeli marathon. The marathon was planned to pass by Jerusalem’s occupied neighborhoods. At approximately 02:00, on Sunday, 17 March 2019, Israeli forces moved into Wadi al-Joz neighborhood, east of occupied Jerusalem’s Old City. They raided and searched a house belonging to ‘Areen Haitham al-Za’neen (23) and then arrested him, taking him to an unknown destination. At approximately 03:00, Israeli forces moved into Jabal al-Mukaber neighborhood, southeast of occupied east Jerusalem. They raided and searched a house belonging to Fares Ayman Salem ‘E’wessat (25) and then arrested him, taking him to an unknown destination. At approximately 05:00, Israeli forces moved into Beit Hanina village, north of occupied east Jerusalem. They raided and searched a house belonging to Shady Motour and then arrested him, taking him to an unknown destination. Shady’s family said that Israeli Police and Intelligence Service raided the house, arrested their son Shady and then took him for investigation. They also said that the reason of his arrest is still unknown, but it should be noted that the Israeli forces continuously target Shady as he was arrested before for activism. The Israeli forces arrested Shady on January at al-Karama border crossing with Jordan and investigated him. They released him under the condition that he does not travel for a month. At approximately 08:00, on Sunday, 17 March 2019, Israeli police arrested Hamza Ibrahim al-Nabaly (30), a guard of al-Aqsa Mosque, after getting out of one of the Mosque’s gates in occupied east Jerusalem’s Old City. Islamic Endowment “Awqaf” of Jerusalem reported that the Israeli police stopped guardian Hamza al-Nabaly at al-Majles Gate, one of al-Aqsa Mosque gates, before they arrested him. They also added that the Israeli police took al-Nabaly to a detention center in the Old City for interrogation. It should be mentioned that Israeli forces previously carried out an attack against al-Aqsa Mosque guards and Islamic Endowment employees for opening al-Rahma Gate and for the worshipers, who were based there, despite of the Israeli tight restrictions. At approximately 07:00, on 18 March 2019, Israeli forces arrested Heba Sarhan (34), a guard of al-Aqsa Mosque, from Salwan village, south of occupied Jerusalem’s Old City, while she was getting out if al-Asbat Gate (Lion’s Gate).